Following conversations between Chris Kelly and the Liverpool Irish Festival, it was apparent that Chris’s knowledge of music was deep and bountiful. In the spirit of offering context to Irish culture and to increasing general understanding about its origins, pathways and future, Chris has drafted a short history on traditional Irish music, which we hope will give people some food for thought, names to look up and a context for why it is still so important to Irish communities today, not to mention its incredible impact on popular music around the world! Traditional Irish music began as an oral tradition, passed down from generation to generation by listening, learning by ear and without writing the tunes down on paper. This practice is still encouraged to this day. The traditional music played by the Irish came to Ireland with the Celts 2,000 years ago. The Celts were influenced by music from the East and, it is believed, the traditional Irish harp originated in Egypt. The harp was the most popular instrument in ancient times and harpists were employed to play for the chieftains and to create music for the nobles. This was until ”The Flight of the Earls” in 1607 when the native Irish chieftains fled the land under threat of invaders. With the flight of their patrons to mainland Europe, the harpists were left to travel the country and play wherever they could. The most famous of these was Turlough O’Carolan (b.1670-d.1738) a blind harpist, composer and singer whose great fame is owed to his gift of melodic composition. Although not a composer in the classical sense, he is considered to be Ireland’s national composer. For almost 50 years, O’Carolan journeyed from one end of Ireland to the other, composing and performing his tunes. Not until 1762 were the tunes written down for the first time and collectors began to travel the country compiling music that can still be viewed today. The largest collection of traditional and folk music in the world is in the Irish Traditional Music Archive in Dublin. Traditional music has travelled much further than the 32 counties of Ireland. It has travelled around the world with the country’s long history of immigration. It was during the time of the great famine of 1845 that vast numbers emigrated, mostly to the United States, bringing the music with them. In 1920 Irish music had a revival in the States, when recordings were made for the first time. Michael Coleman’s fiddle recordings were to influence fiddle players in the States, Ireland and around the world for years to come. The style of music was opened to a wider audience still, due to the influence of Sean O’Riada, who established a traditional ensemble, Ceoltoiri Chulainn, who were heavily influenced by classical music forms. The Chieftians were later formed by Paddy Moloney from that ensemble. The main traditional instruments are fiddle, Celtic harp, Irish flute, penny whistle, uilleann pipes and bodhrán. More recently the Irish bouzouki, acoustic guitar, mandolin and tenor banjo have found their way into the playing of traditional music, mainly due to Sweeny’s Men and Emmet Spiceland in the late ‘60s, followed by Paul Brady, Andy Irvine, Planxty, De Danann, The Bothy Band, Moving Hearts and many others, too numerous to mention. There has always been a large Irish community in Liverpool, and the surrounding area, and the music has been passed on from generation to generation through the likes of the original Irish Centre in Mount Pleasant (also known as The Wellington Rooms), with music lessons for all types of traditional instruments. Sadly, that venue closed many years ago, moving to St. Michael’s, just off of West Derby Road. 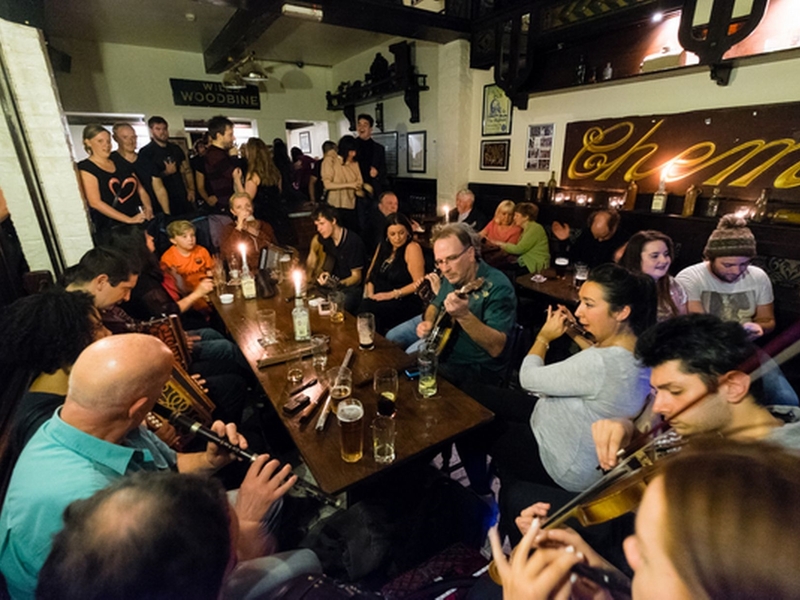 The Irish pub scene appears of late to have had a bit of a resurgence and with folk clubs and pubs like The Caledonia and the annual Liverpool Irish Festival facilitating the ongoing tradition there is great hope of the tradition carrying on for many years to come. All I can say, after all that is ”keep music live and support the venues that support live music”. Christopher Kelly – Chris’s early musical influence was The Beatles. He got first guitar at the age of 13 and played in showbands (pop and country) all over Ireland until going to the States in 1969, returning after 6months. Chris came to Liverpool in 1971 and is still here, becoming involved in folk clubs after he and long-time friend John Marshall visited Maghull Folk Club in the early ’70s, mainly playing John Prine, Micky Newbury and Steve Goodman material, later shifting to traditional music. Chris and John have been playing together on and off ever since, despite John’s many years in Scotland and Wales. In these times, Chris has played in various bands including Cairde Ceol (Musical Friends), Cracker, Jig-a-Jig and has done duo work with Tony Gibbons and other solo projects. John returned to Liverpool over a year ago and Chris and John are back together (musically). They have put together a vast collection of traditional songs and tunes in that time, performing as Tippin’ It Up. Chris, John and some other musical friends are recording an album of original material which should be ready in late 2016/early 2017. Tippin’ It Up are playing at a couple of the social seisiúns at #LIF2016, at the Everyman.